Suede Mat Board is a fabric on top of a 4 ply paper board, the colours are numerous and some have an embossed design. The texture is smooth, soft to touch and can hold the dust of chalk pastel so that a vibrant image will stay on the board. Chalk Pastel is a colour powder art medium that comes compressed in a stick form. It looks like a stick of chalk that is used on black boards or sidewalk art, but the pigment is much brighter. When drawing with pastel onto suede the pigment adheres to the fabric fibers creating a unique and bright work of art. Today’s art lesson was based on the story The Paper Bag Princess, using texture and colour. 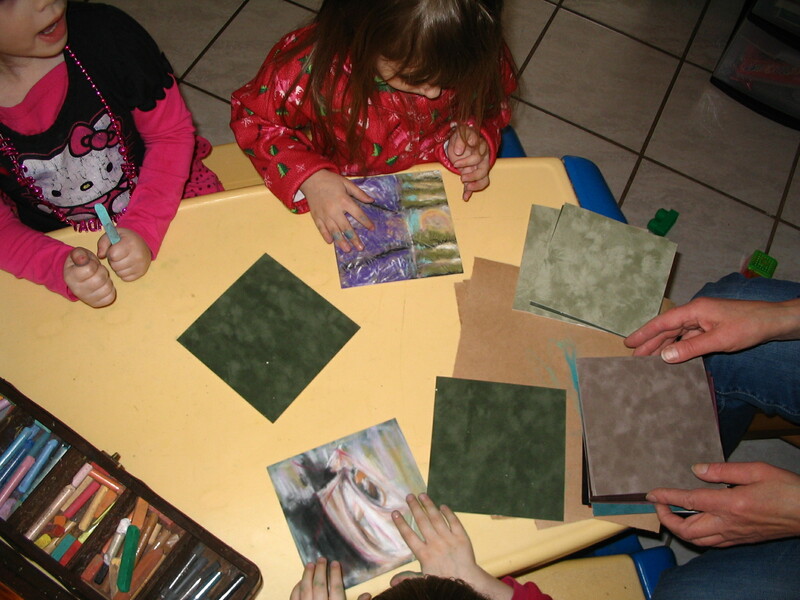 After reading the story the children used the pastels on paper bags, then moved to the suede. 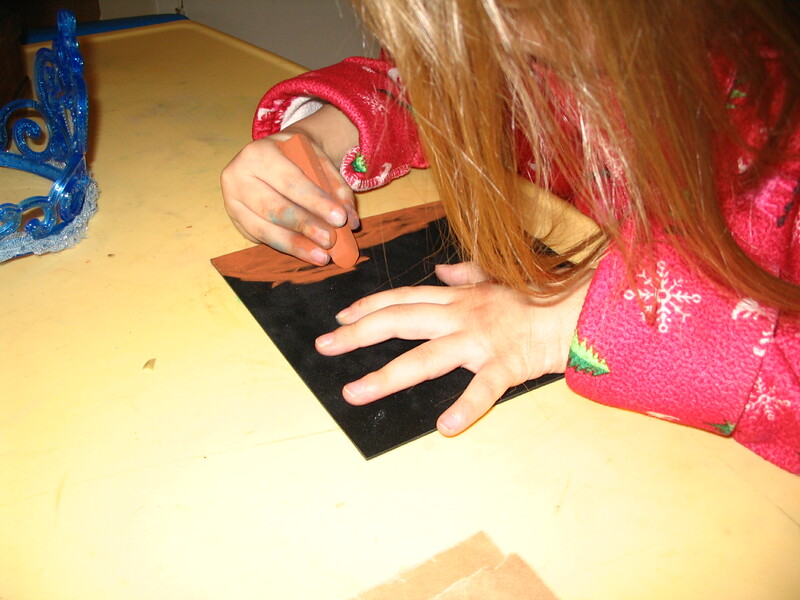 Then discussing and feeling the texture of the suede, the kids held the sample drawings on the suede. Adding meaning to the material made all the difference in wanting to use the suede over the paper. Choosing to use the warm colours to draw the dragon’s fiery breath, then they chose to draw dragons and princess’. The children enjoyed sharing their colour discoveries with each other. They discussed the colour choices both in pastel and suede, some even chose to use the smooth backside of the suede and two-handed drawings. 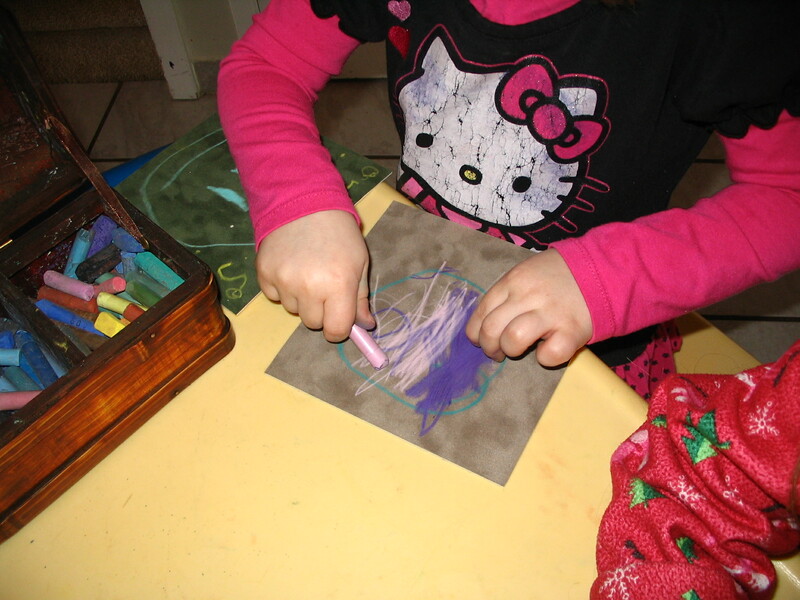 During the drawing process it was important to use their thumbs for smudging the pastel into the fabric paper. 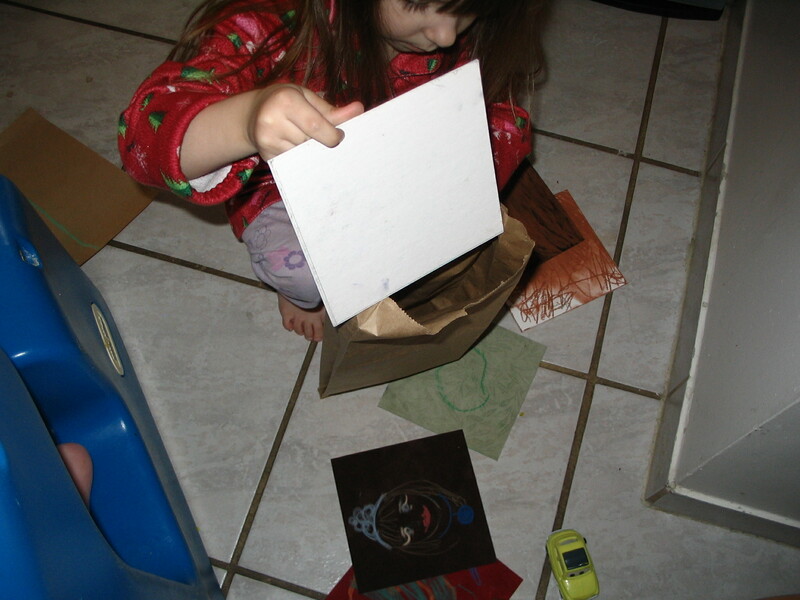 In the end who would have guessed that the real FUN began when the children put their art into the paper bags. 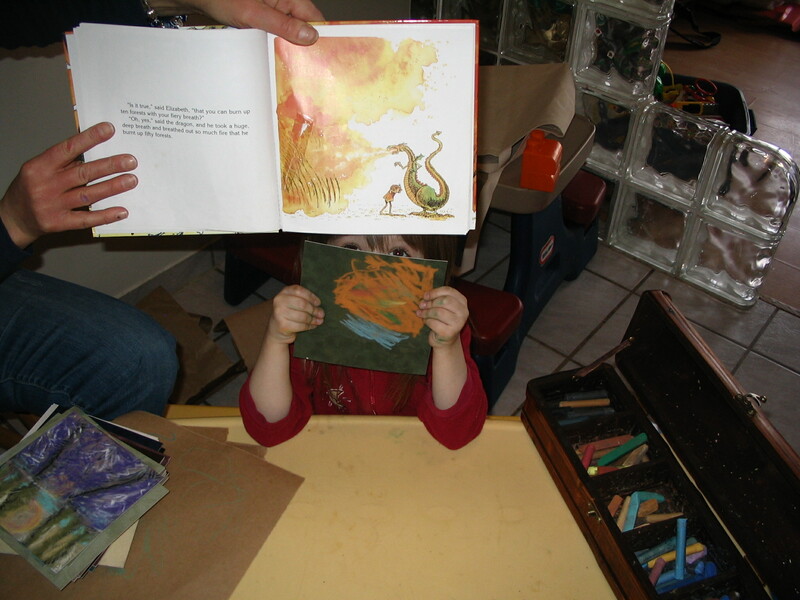 In the story the princess knocks on the door of the dragon’s cave, the storyteller can knock on the table or floor. 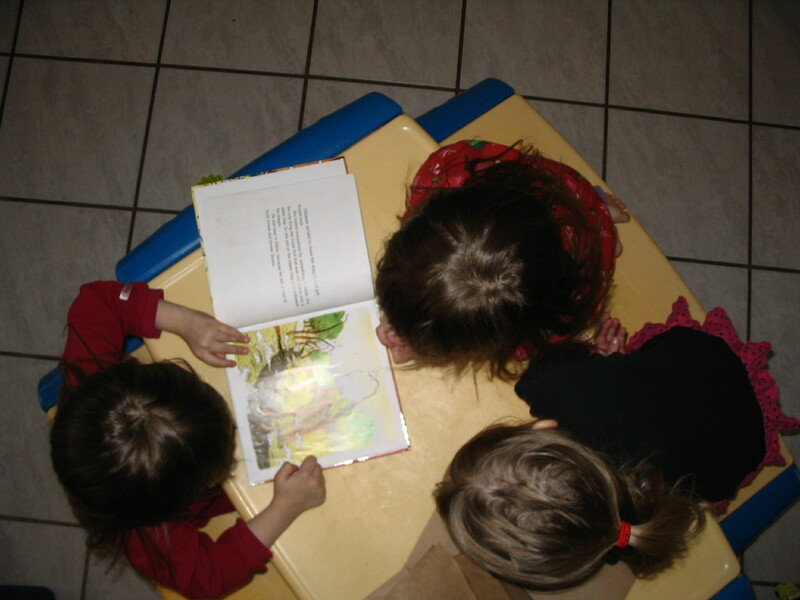 When the children request the story to be read again they participate in the knock and the cave door. Having a variety of colour in both pastel and suede is a great conversational theme while they are creating and telling their own story. Life is simpler when the suede mat pieces are all the same size. damp paper towel to clean hands. This entry was posted in Art Education and tagged art, Color, Drawing, Paper, Paper Bag Princess, Pastel, Pencil, Visual Arts. Bookmark the permalink.